Bathing in the swimming pool is equipped with facilities water boom and a winding waterslide and water vat, certainly a dream of every child. But sometimes all that hard to come by every parent. In addition, there are no dibatam also because admission is quite expensive. Usually the parents should encourage their children to Jakarta or Singapore to enjoy it. how to get there is so expensive is not it? But do not worry from 1 November 2010, everything will change. Because in the Top 100 Mall Batu Aji will soon open a full swimming pool facilities will realize the dreams of children and their parents that is Water Park Top 100 Located right on the main mall building, located in Tembesi. Various equipment and water-related games or contained. Starting from the water boom, winding waterslide is certainly exciting, barrels filled with water and then diguyurkan to the visitors, until the food street facilities and fitness center. Can you imagine the fun is not it? 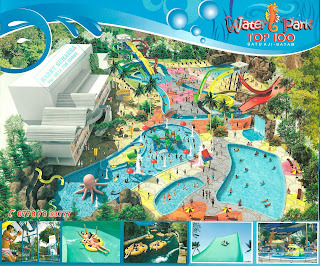 Although comprehensive, extensive and very suitable for a family playground, but the entry ticket price is very cheap. Moreover, the current Water Park Top 100 already provides Mamber Card familly, exclusively for you and your card is keluarga.Dengan member and family can enjoy all the facilities a game that is in the area of Water Park, unlimited, anytime. "Every day would swim from morning till night were allowed, not restricted," said Sweri Ming, Operations Manager Top 100 Batuaji. Described Sweri, to become members, the requirements are very simple, the process is also very fast. "Consumers simply register at the Atrium King Top 100 Batuaji 1st floor, with a copy of ID card and family card," he explained. Once registered, the names that exist in the family card, the automatic has been a member and can enjoy all the facilities of games available. "What is clear is the head of the family, wife and children, want children one, two, or ten though, everything becomes member, "said Sweri. And what about the cost to be mamber? Very cheap, every family head enough to pay the registration fee of USD 300 thousand. "Not per person yes, but as head of the family. So would the number of families of two people, three people or ten people, is still the list pay $ 300 thousand," he said. By paying Rp 300 thousand of this, the family can enjoy all the facilities available free of charge for three full months. "There is no restriction days, Monday through Sunday any hour, members can enter for free," ungkapnya.Pendaftaran Mamber Card familly has been started from last October 1, 2010. To entertain the consumer, the Top 100 Batuaji also invited a number of country bands every Sunday. "We want to make the consumers who come berbahagian and entertained, so every Sunday we would invite the band," katanya.Nah, fathers and mothers, if you want to see happiness and smile and laugh off the full satisfaction out of the face tiny faces of your children, waiting for, register your family become Mamber Water Park Top 100 Batuaji, right now. oh yes!pls ensure safety in you water boom pool.Make sure your ceramics are not broken.my nephew just received 6 stictches after swimming in your pool.thank you for bearing the hospital cost but what a way to end when none of your management or staff did a follow up with us.